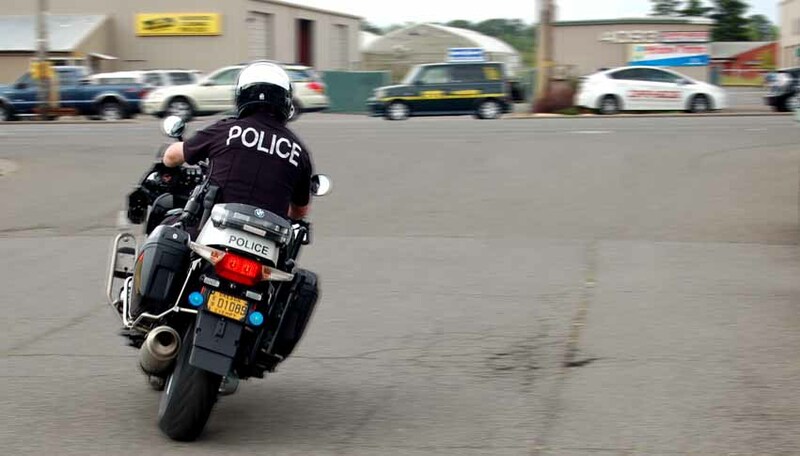 Traffic safety issues are a top community concern in Eugene, and the Eugene Police Department has responded to that concern with a focused, dedicated team of motorcycle officers to enforce traffic laws. The Traffic Enforcement Unit currently comprises seven officers and a sergeant. While all Eugene Police patrol officers can and do make traffic stops when they are not responding to calls for service, members of the traffic team are able to devote most of their workday to traffic issues and respond to community requests for neighborhood enforcement. The major goal of traffic enforcement is to change driver behavior to decrease dangerous collisions and improve neighborhood safety and quality of life. Eugene Police motor officers’ primary duty is enforcing traffic laws within the city of Eugene, including focused enforcement in response to neighborhood speeding complaints. In addition to radar speed patrol and other standard traffic enforcement duties, this unit also engages in focused patrols and public education campaigns such as saturation patrols for red light runners, seat belt safety blitzes and crosswalk pedestrian safety operations. They also provide traffic control at civic functions, sporting events, parades and for visiting dignitaries, and provide other traffic-related community services. Additionally, motorcycle officers can respond to patrol calls for service as needed; their mobility allows them to respond quickly to high-priority calls and as backup to other officers. that can affect them for a lifetime. Oregon Impact - Oregon Impact provides educational experiences to end impaired and distracted driving. With an emphasis on teen drivers and those that ride with them, Oregon Impact works with middle schools, high schools & colleges in Oregon and SW Washington, and attends multiple community events each year to open conversations and encourage good choices. On August 16, 2018, we received a delivery for two radar trailers from RU2 Systems, Inc. (Mesa, Arizona) that will be deployed to help combat neighborhood speeding issues. The signage not only provides a heads-up to drivers of their speed so they are aware and can slow down, it also collects data. The trailer’s system tracks when a vehicle goes by and at what speed. From that data, EPD will be able to download reports that effectively show the scope and timing of speeding issues. For instance, that data can show the average speed at any point in the day. Then, if patrol or the Traffic Enforcement Unit resources are needed to help with a neighborhood speeding issue, the department will be better informed as to when the officer resources need to be put in place. The equipment does not capture data that results in citations. Initially the deployments will be for 3-5 days upon request by neighborhood residents and this timeframe will be evaluated as the program continues. To request the radar in your neighborhood or area of concern, please fill out the following form: Speed Radar Trailer Request Form Opens a New Window. Parade Permit/Hold Harmless Agreement/Affidavit Opens a New Window.